What is traveling all about? Just visiting new places? Not really. It is about getting an exposure as well as being comfortable in your own self. You surely would not want to change your style to be liked by people or be noticed by them. Therefore, wear the comfiest combination of clothes in your wardrobe and do not worry about making a fashion disaster or being labeled as ridiculously funny. Traveling in party dresses or something out of the box is not a very good idea as you would want to be as relaxed as possible to avoid any discomfort or restriction due to our attire. And why only women, even men can wear their most cozy pair of clothes and feel absolutely at ease throughout the journey. You do not have to worry about tucking the shirt in your jeans properly when you travel, ‘cause lo and behold! You would soon see the shirt out of your jeans in no time. So it is better that girls wear a tank top or spaghetti and wear a solid or striped shirt over it and keep it unbuttoned. Pair it with good jeans and let the sassiness begin. This style is one of the simplest ones and never goes out of style. Guys can replace spaghetti with a solid colored t-shirt and striped shirt with a checked one. To finish the look, wear a cool converse and go explore the world. Do you know that you can actually reach the airport in an all wake-up look and nobody would even give a tiny notice about it? 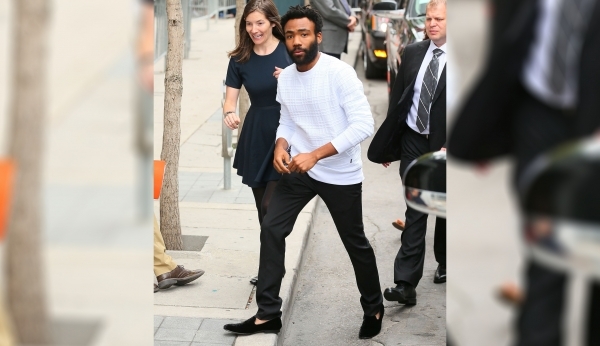 On the other hand, you can even make it to the headlines like Donald Glover did. He was wearing a stretched out t-shirt and sweats that were non-descript a regular pair of round glasses. His sneakers were from Powerphase Calabasas which is pretty cheap. Only thing attracting the eye was his gold chain. Although the combination might seem a bit loud or crazy but it looked quite appealing and affordable. Do not go for flashy stuff from expensive brands. Instead, go for amazing basics from any decent company because they never go out of fashion. There can be times when you have to immediately rush to your brother’s Haldi ceremony as soon as you land, not to mention that there’s hardly any time for changing and grooming. In times like this, you can wear a breezy kurta and pair it up with palazzos. Go for basic colors and add the pattern in the long shrug over it, wear some silver jewellery to finish the look. Juttis would compliment your feet in this. Sweatpants are one of the most casual and amazingly chill for any airport style. But, do not be too chill to wear flip-flops when you travel. For even a person who’s almost luggage free, super rich, cool and worldwide famous should not wear flip-flops. That just mars the entire look you have created. Flip flops here become the deal breaker and be sure of people to be critically judging you for this. Combination matter a lot when you dress-up and Kareena Kapoor Khan knows that very well. Once she was spotted at an airport wearing a distressed pair of jeans paired with a polka-dotted shirt. No makeup look and a handbag complimented her look. Who doesn’t look cool in a leather or suede jacket! However, you have to know the right time to wear them. Wearing it way too early in the season especially by men who consider it to be a style trend can turn out to be their biggest mistake because you can easily get all sweaty which would soon be visible in your armpits area. Be summer friendly with a denim shirt jacket instead. Beneath it, wear a plain white or grey tee, blue jeans, and white sneakers. Nothing possibly can make that look old. There are times when you want to wear a dress to the airport and you think and rethink whether that would be right choices. Well, go for a long ankle or even knee-length striped dress which has a split on one side. Make sure the split isn’t a bit too much to make you uncomfortable. Wear white sneakers to add to the look. And in case you are traveling to some cold destination, wear a ripped denim jacket over it and be ready to spread sassy vibes. Zac Efron kills the boy next door look every time we cameras catch him in airports. He breaks the style trend and yet creates his own dimension in it. You can do that too with a suit of unconventional color or an oversized winter coat. For the casual look, go for sweatpants and crocs which are both in trend and is super comfortable for your journey. For the pants, wear something stretchy or dark colored jeans. Keep your yoga pants away because that is way too simple to be cool. A boyfriend cardigan, which is long enough to cover the rear ends, and underneath, a loose cotton t-shirt would go well. Oversized cashmere wool scarf is both cool and can be used as a blanket to cover you in the flight. Slip ons are the best for your feet to match this look. To create an impressed look, you do not need to earn a bag full of money and that is proved time and again by how the style icon and footballer David Beckham dresses himself. Black sweats without any logo, square-shaped shades, big bag pack and a military hat is a combo that any guy can afford. In fact, for long distances, the attire was practically chosen and wonderfully carried out. For any style to work on you, you should be confident enough to carry it. Know your body shape and structure and choose any.